The whole concept of you as a brand isn’t novel any more. Today, a good number of people understand that they have a reputation/brand that they have consciously or unconsciously developed and that this reputation to a large extent decides how much opportunities people throw their way and how much success they achieve in life. However, I have come to know that strong brands are built deliberately and on purpose and good success is always intentional. How then exactly do you build a strong personal brand? How do you ensure that people know you for what you want to be known for? How do you make certain that you are not mis-communicating your brand and that your brand isn’t being misunderstood by the people who interact with it? The place to start is to engage the power of focus. Focus isn’t just the ability to stick to one thing; it is likewise or even more importantly the ability to say no to everything except one thing. Strong brands are built on the significance of one; their ability to be the first associative name when that thing is mentioned. Let me give you examples, when I say nation building, Fela Durotoye comes to mind. When I say change (good or bad), APC comes to mind. When I say soft drink, your mind easily remembers Cocacola. That’s the power of one. So first, identify your one thing. After identifying that thing, build your expertise and make enough noise till someone gives you a chance. One grave mistake to do in life is to wink in the dark. You have both wasted your effort as well as denied others the opportunity to experience something good. Yes it’s true that opportunity eventually finds the prepared, but sometimes it finds the fool who isn’t ready for it first especially if the prepared does nothing to be noticed. You must be ready to do all it takes to promote yourself and whatever it is that you do. Stop at nothing to raise your voice; to raise your work! When opportunity eventually shows up, make sure you exceed expectations. Surprise them and give them more than what they bargained for. One thing that would do is that it will bring them back again. The second time they come, show them they can trust you by being consistent with the experience you delivered the first time. However, you can only achieve this if you understand that the first time you get an opportunity, it is a privilege; the second and subsequent time, it is an honour. You must nonetheless be willing to treat every opportunity as a privilege so that you always give your best, thereby always earn the right to more honor. Obviously, it takes character to treat every honor as a privilege, and character is the end product of a life lived completely on values. Your values are the things that you stand for. They must be invaluable to you because once they have a price tag, someone will pay you to compromise. Do you have values? So here is the flow of thought: Values will form your character. Character will enable consistency and competence. But competence should be specialized. Specialized competence should be promoted so as to attract opportunity. When opportunity shows up, character must not die; answer to your first opportunity with competence and consistently to the rest with character. A lot of businesses are not successful and profitable in Nigeria because those who run them are going about their business the wrong way. Statistic says that only 1 in about 3 startup businesses in the country lives longer than 5 years. This shows that there is something wrong with the way our entrepreneurs exercise their entrepreneurship. I have found that most business owners in Nigeria are all about the money. They are only in business just to make money from people and enrich their pockets. They really don’t have long term commitments to the business or the people they serve. They just want their business to cater to their various needs and luxuries now. I am of the strong opinion that meeting needs ought to be the priority of any business venture; solving problems and not making money. I don’t like the idea of starting business just because you have to make ends meet or simply because you cant find a job. That’s the reason many people start businesses in Nigeria. These are good reasons to launch into the waters of entrepreneurship but they should not be your only and or leading reason. I don’t like the idea of starting business just because you have to make ends meet or simply because you cant find a job. These are good reasons to launch into the waters of entrepreneurship but they should not be your only and or leading reason. This is not to say that making healthy profits in business is wrong because right next to meeting needs is making profit. But never before it. You can make profits without meeting needs; it won’t just be sustained. And yes, you can meet needs without making profit too; but that is hardly the case except you are running a charity. The point however here is that your chances of making sales, increasing returns, and making healthy profits are enormous when you are focused on meeting needs rather than on making money. We don’t have strong brands in Nigeria. A strong brand is one that resonates both functionally and emotionally with its customers. 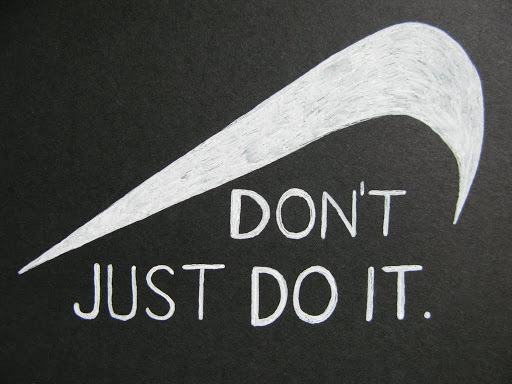 No brand will promise to just make money off its customers although many act just like that. They don’t promise that because it is common sense to know that people are not looking for people to give their money to; they are seeking people who will solve their problems and they will pay sufficiently for such help. It is said about God, that we shouldn’t go after his gifts but rather after him, the giver of the gifts. Likewise, businesses shouldn’t go after the money of their customers but rather the customers themselves. When you have me, you have all that I have (my money inclusive). Even in cases where repeat business isn’t possible, the moment you win me over, you can be sure I’d replicate myself to patronize you through friends, associates and family. Businesses shouldn’t go after the money of their customers but rather the customers themselves. Businesses ought to be in the business of sweeping their customers off their feet, taking their breathe away, blowing them into unprecedented ecstasy. You should be trying to win people and not make money. Because money is temporal, always moving places, but people are always there. Because money is owned by people and not people by money; it is wise to be after them than after their money. You cant make real money in life if you are all about money. You have to be about several other things. You have to be about service, about giving, about management, deferring gratification, making sacrifices and investments, making wise decisions, etc. Money alone doesn’t make rich, these other things do. There are two categories of people in the world- The BUYERsellers and the SELLERbuyers. Everyone buys and sell. The difference between both categories is that the BUYERseller buys more than he sells while the SELLERbuyer sells more than he buys. The BUYERseller doesn’t necessarily buy more than the SELLERbuyer does, he/she only buys more than he/she sells. Countries can also be grouped in a like manner. While some countries are BUYERsellers, others are SELLERbuyers. Nigeria for instance, belongs to the former. We import more than we export. As a result, we run a deficit balance of trade, and hence, we have an economy that could be doing far better than it currently does. We are not alone. Most third world countries also belong to the BUYERseller category and they’ll remain third world until that change. Developed countries on the contrary are SELLERbuyers; and as long as they remain that, they’d continue to be ahead. It’s important to note also that the country a man lives in doesn’t necessarily decide which category he falls into. There are SELLERbuyer Nigerians as much as there are BUYERseller Americans. So neither race, background, gender or any other caste can be used to predict the market category a person falls into. So at every level and in all cases, it’s all about personal choices. If you seek more value than you add, then you are a BUYERseller and if you choose to give more value than you seek, then you are a SELLERbuyer. A BUYERseller is primarily selfish. He cares basically about himself only. He isn’t bothered about what other people need. As long as his needs are being met, he’s good. A SELLERbuyer on the other hand is selfless. He is so concerned about the needs of others such that sometimes he even places that before his own needs. His satisfaction isn’t in having his needs met, but rather in meeting needs. A BUYERseller searches for people who have the supplies he requires. He is willing to devote his brain power, energy and resources (money) towards meeting his needs. He works because he needs to; because that’s the only way he can pay for his needs. He is typically the kind of person that can’t wait for the closing hour. He’s not concerned about doing his best job, he just wants to get through the day. A SELLERbuyer is consistently looking for people who needs what he has on offer. He devotes his brain power, energy, resources and his whole self towards meeting the needs of others. He doesn’t just work for the money, he works because he is passionate about what he does; about the change he is making in the world and he is simply glad he is being paid handsomely for it. He is never a part of the problems of the world, he is the solution to them. A BUYERseller is a consumer. He places premium on liabilities (things you spend money on) while a SELLERbuyer is a producer. He places value on assets (things that fetch you money) instead. One would expect a BUYERseller to have more liabilities than a SELLERbuyer but NO! that’s not the case. Although a BUYERseller has more liabilities than he does assets and a SELLERbuyer has more assets that he has liabilities, SELLERbuyers generally have more liabilities than BUYERsellers could ever have because they usually have more money. The situation we have in the world today is such that we have more BUYERsellers than we have SELLERbuyers. By effect, it is safer and more convenient to be with the BUYERseller group but it is far better and profitable to be in the SELLERbuyer group. It’s basic simple economics; value is directly proportional to rarity. The world has more consumers than producers; that means more problem owners than solution givers. So there is a greater demand for solutions than the supply of it. Money usually flows in the opposite direction of value; those we seek it will pay those who give it. Inherently, solution is more valuable than problem; because it is rare. And the fact that there are more people seeking it than people giving it means that a producer gets to deal with more consumers than consumers get to deal with producers. What should you do with all these terminologies and stuffs I’ve said? Make a change if you are a BUYERseller. You were not born that way; you became it by reason of the choices you have been trained to make. Now you can renew your mind and fix things. You can decide that you’d give more value than you’d ever need. That’s the only way to getting paid more than you’ll ever pay. And beyond the promise of wealth that this change offer; the joy of seeing yourself change the world by solving its problem is extraordinary. Nothing can be compared to it! One thing that aspiring speakers look forward to is an opportunity to speak at events. The bigger the crowd, the bigger the excitement; the higher the caliber of people you have in the audience, the better the opportunity. I recently turned down one such opportunity. It was at an event that had one of Nigeria’s foremost and most notable speaker and consultant in attendance. Okay, maybe I didn’t turn down the opportunity per se, but I didn’t push for the chance even though it was somewhat presented to me. The decision could have been motivated by either of 2 things- fear or wisdom. The prosperity of fools will destroy them (Proverbs 1:32). I wasn’t prepped to make a presentation that day. If I had decided to just wing it, I feared that I’d flop it and make a mess of myself. I believe that It is somewhat wise to turn down opportunities you are not prepared for. I believe that It is somewhat wise to turn down opportunities you are not prepared for. A take home from that however is to always be ready. Wiser is the man who is ready for his opportunity when it comes. Like the 5 wise virgins in the bible, don’t wait for opportunity before you get ready, instead be proactive; be always ready! Maybe I was ready; I was simply also afraid. Fear is a dangerous enemy. I have found it to be more dangerous than whatever caused it in the first place. Fear is a fierce thief that steals your willpower and prevents you from achieving things that aren’t beyond you. Often it starts little, but the more you tolerate it, the stronger it gets and the weaker your will becomes. A take home is that one should be ruthless when dealing with fear. Because fear never goes easy on you, don’t go easy on it. You’ve got to kill it before it kills you. How? Take courage. Courage they say isn’t the absence of fear, but taking action despite of it. Bringing it home, how can you relate this to your brand or business? Also, believe in your brand and the experience you have to offer. It is only then that others are permitted to believe in it too. Don’t be afraid to fail; failure is often a stepping stone on your way to success. Believe in yourself enough to share your gifts with the world. Many rewards await you. Ever had anyone advice you to always start small and then build whatever project or business you have into a big deal. Well I have… and for a long while even though I see sense in what they are saying, I have always struggled with settling with that in my mind. Some may call it greed, others ambition, all I can say is that I like big stuff, I have big dreams and I serve a big God too( and he does things big). So an advice to do anything small is usually a bit difficult for me to accept or settle for. So today, I wanna do a little challenging of this ancient advice. I’m not really disputing its credibility because for as long as I know, many big things today started small; but then I want to take a more critical and analytical look at the theory so as to come to terms with what it really means. I’m gonna take a differing perspective looking at the same concept and draw up possible new (innovative and not necessarily inventive) meanings from it. The idea behind the theory I believe is that there is and should always be room for improvement. What this implies is that things can grow and would grow; all things being equal, if given time. Therefore, size shouldn’t stop you from starting a business project or acting on your idea because when you launch out and do what you are supposed to do, in time it would grow. The other idea behind this wisdom is to prevent people from procrastination. You should begin with what you have and from where you are. The need to have it big usually prevents people from starting and if you don’t start, how can one achieve anything or succeed? Its 3rd emphasis I also belief is contentment. Ambition without contentment is what births greed. Ambition I would call a virtue but without any form of contest, greed is obviously a vice. So by starting small, it shows that while in pursuit of the big things ahead, one can be contented enough with whatever he has no matter how small and thus not despise the days of little beginnings. Contentment always holds great promises for us but greed sooner or later fails. Just like impatience, it may work for you at some point and earn you things, but one day, sooner or later, it will be the source of trouble, delay, and problems for you if you keep it at it. Small is a relative term. You’d agree with me that what bill gates will call ‘chicken change’ is no chicken anything to most of us. So what qualifies a thing as small isn’t the thing itself but rather the person qualifying it. So if you are starting a business, your starting capital could be a million dollars or just a thousand naira….both could be small or big depending on who’s looking at it. 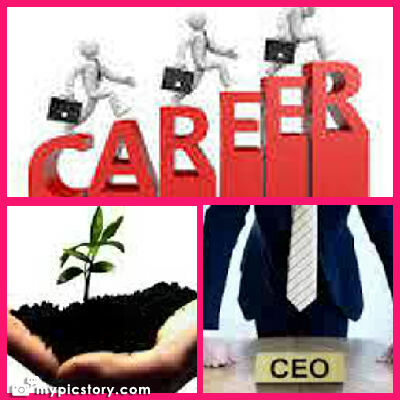 Likewise when you are searching for your first employment; small could be a 6 digit salary or a humble 4 digit figure. In the same vein, ‘big’ which is what small is supposed to grow into is very relative. 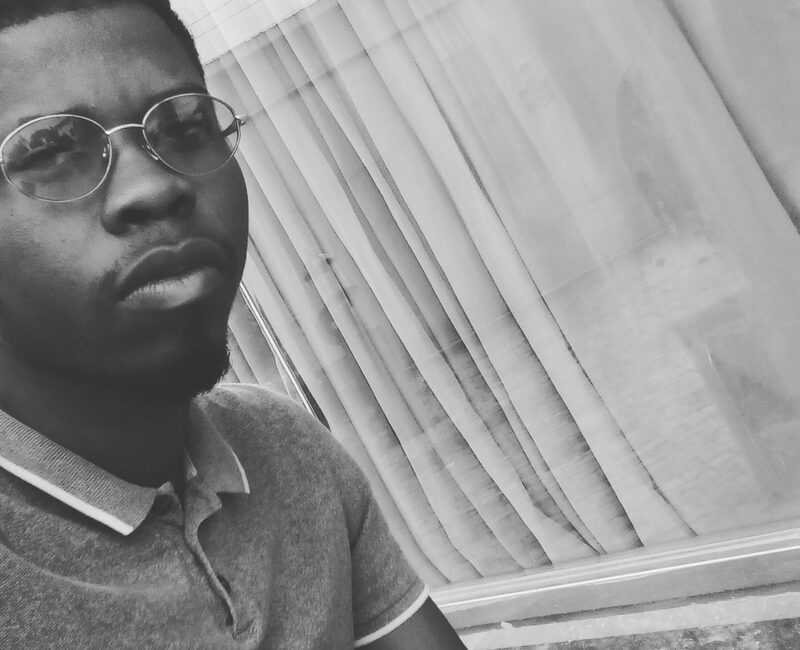 So the guy who started ‘small’ by earning N150,000 could say in 5 years grow into earning N5,000,000(which we will now call big) while the other one who started with just N9500 could grow big and start earning N120000 in 5 years. They both started small and grew big but the terms small and big are relative. And so I believe that starting small shouldn’t be an excuse to justify and glorify mediocrity or non-excellence like most people nowadays do. Under the cover of starting small they refuse to maximize opportunities and potentials. So they believe (or at least act as if they do) it has to be bad first before it gets better forgetting that the true trend and flow of things is good-better-best and not bad-better-okay. Like it is usually said, good is usually the enemy of best and we have seen people abandon the best to settle for just good just because they want to start small. My question to you today is this. Who says your first job as to be a crappy one? Or that your first car must be a jalopy? Can’t your small be so good and yet still get better? My submission basically is this: yes, it is good to start small and to always begin with what you have where you are; but while starting small, make sure you adopt what we call in risk assessment the MAXIMIN approach. i.e. go for the best among the least. Start small, but make sure it is your best small and not just any small. Since the goal is to eliminate procrastination, ensure you do just that. While seeking out your best-small; avoid or reduce procrastination to the bearest minimum and while eliminating procrastination, keep in mind the consequences of undue haste and so balance up your planning, targeting, and timing between undue haste and procrastination. And regardless of where you start, keep striving to grow bigger and bigger because there is always room for growth. When we stop growing, we start dying. It is the nature of life to grow if the right conditions are available…so keep creating the right atmosphere and conditions for growth. When that is in place, growth is always automatic regardless of size and level. Truth is, if 2 different people start the same business, with the same set of skills and management strategy; all other things kept equal, the person with better capital for instance, 10yrs down the line probably has a better chance at more success than the other guy. I believe it’s better to start from 100 than to start from 1. If you can start from 100, it is laziness and mediocrity to be satisfied with 1, but if all you have is 1 and if that’s truly the best you can do, then 1 is the golden number for you to begin from. 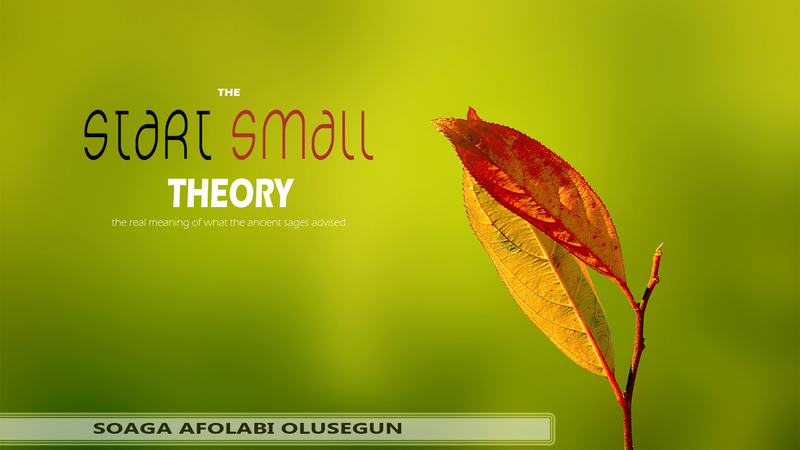 With this, I hope I’ve been able to convince and not confusr you about the start small theory. I hope to develop this into a mini e-book soon. You guys would be the first to hear if I do. Any questions or comments could be directed to me via the reply feature underneath. Also please endeavour to share this link with your other friends and colleagues. Thanks and God bless! The 2 paths to Financial Freedom. On the mind of mind of most people I know, we are constantly asking ourselves, how can I make more money? For many of us in school that are about to graduate or have just graduated from college, we are pondering what next. We all want to find that path that leads to our land of freedom. Where we can maximize life and find happiness. A job gives you security, a business Gives you opportunity. If you have a good job and you are doing your job, you can be rest assured that regularly you’d have something to fall back on. Something steady you can plan on. And always rely on. A business however is quite different. When you about to start, it doesn’t give you security, only. Promises. Its like planting a seed today. It might germinate and it might not. If it doesn’t, its your big loss and you might have to go hungry tomorrow for it. But then, just as a seed. planted poses a risk of not germinating, it also avails you great opportunity. You can count the number of seeds in a fruit, but cannot count the number of fruits in a seed. There is usually opportunity at the other side of the coin of risk. And starting a business offers you that. Businesses are often possibilities rather than final-ities. They have potentials of helping you fulfill your greatest financial fantasies and desires. A quick look at the richest men you know, and you’d see that they all run businesses that one day was only like a seed- risk and opportunity. For a young person about to enter the adult world of self dependency and responsibility, or someone else who is contemplating quitting his job or starting a business, you must recognize that both are quite important. There are times when being secured and ensuring your family’s security is all that matters. But there are other times when we need to seek something better than being safe. Things like experiencing the world that is more than ourselves and probably creating security for others other than ourselves are very commendable and self rewarding. My answer to my dear friend was this- I am for both. I’m in school to get a degree and I intend to pursue a career I’m passionate about but also well keen to have my own business. I take one of my biggest learning on earning from billionaire investor warren Buffet: don’t put all your eggs in one basket; always have a multiple stream of income. On whether it is possible to combine both effectively? Answer is yes. At least for a start. Till your business can effectively provide you the kind of security any job could. You only need to set your priorities right. Getting a new job will require you. To focus on it and make it a top priority. So if that’s your option A, nothing stops you from having an option B. Afterall there are 26 letters in the english alphabet. Only remember that A always comes before B. There is a great world of opportunities waiting just for you. Take it! Go for the best and never settle for less. There is not a scarcity of money, only of men who REALLy have it. Do more than wish to be one of them, become it. 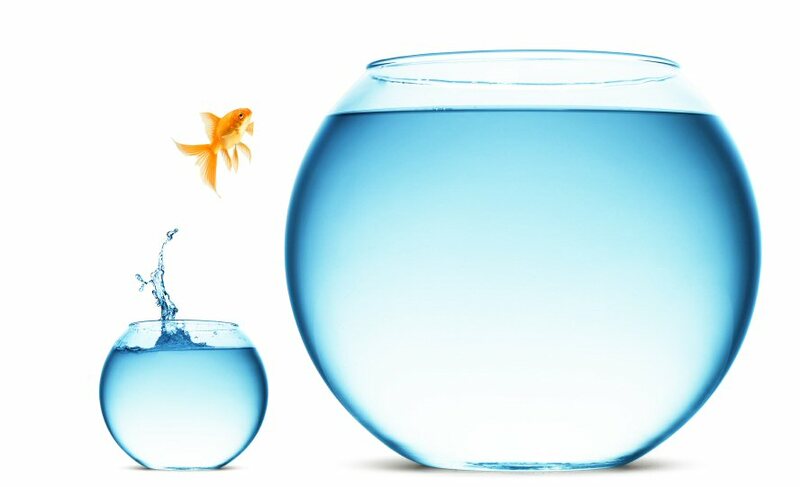 Job seekers seek to play it safe but business owners are risk takers. When we only play safe, we deny ourselves the opportunity to live. While we strive to make a honest living, we must however ask ourselves whether we are honestly living or just bearly existing and surviving. Man was not created to just survive, he was created to live; he wasn’t created to simply manage life and its resources, he was designed to rule over them. Always remember, no matter how crowded the top seems to be, there is always an extra space to accomodate you….only be interested enough to go for it. Please feel free to share this and drop your comments too. I would really appreciate it.